A big week for the rankings! A significant reshuffle on par with Week 6. As opposed to previous weeks in which only a couple teams had big moves in the rankings, in Week 10 we have six different teams moving ten or more ranks. Arizona and Washington shoot up, while Buffalo, Denver, Miami, and Oakland collapse. Even though the aggregate number of rank changes this week is less than in Week 6, the variance of rank changes in Week 10 is much higher than in Week 6. This means that in Week 10 there are more teams moving very few spaces and a significant number of teams moving 10+ spaces. In Week 6 all teams shifted ranks, without as many outliers either moving 0-1 spaces or 10+ spaces. 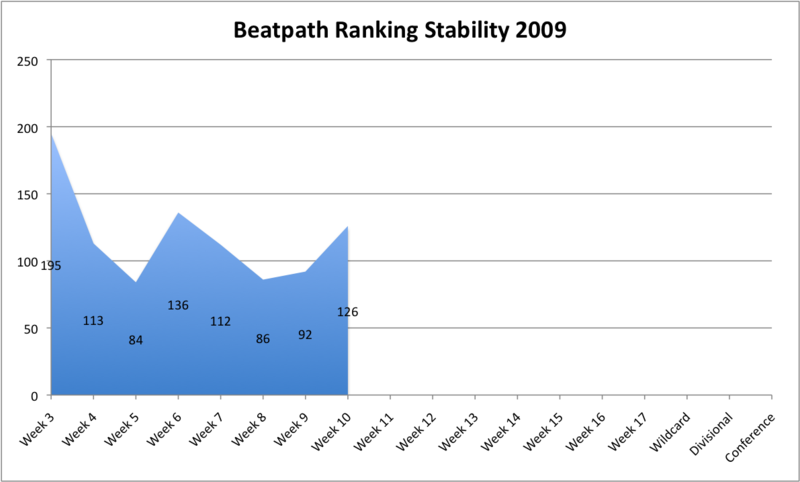 With the new, flatter graph, the system’s confidence in making picks is lower this week than in previous weeks. Oddly, last week’s picks suffered the most in the mid-range, rather than in the low confidence range. 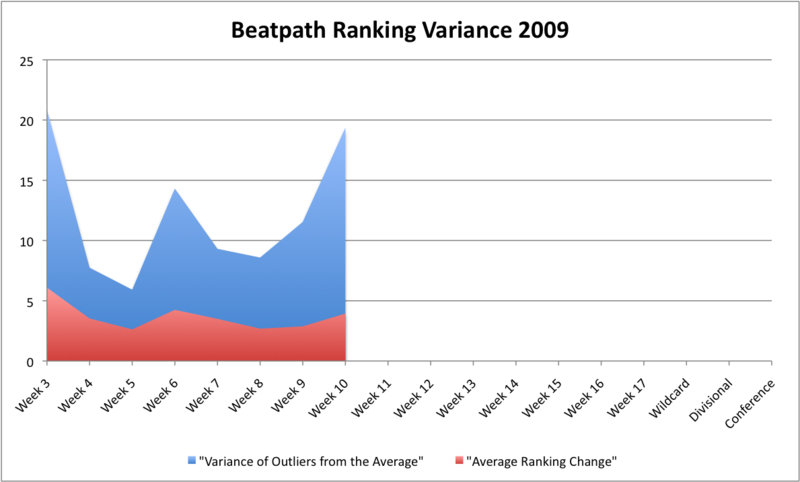 We’ll see how this week’s flatter, more ambiguous graph performs. The match-up that stands out most to me is how closely the system calls the Dallas-Washington division rivalry game now that Washington has beaten Denver. As usual, I’ll return to fill in the results as they roll in.